Tunes in a variety of styles, with lyrics, actions and space for improvisation and copy–backs. 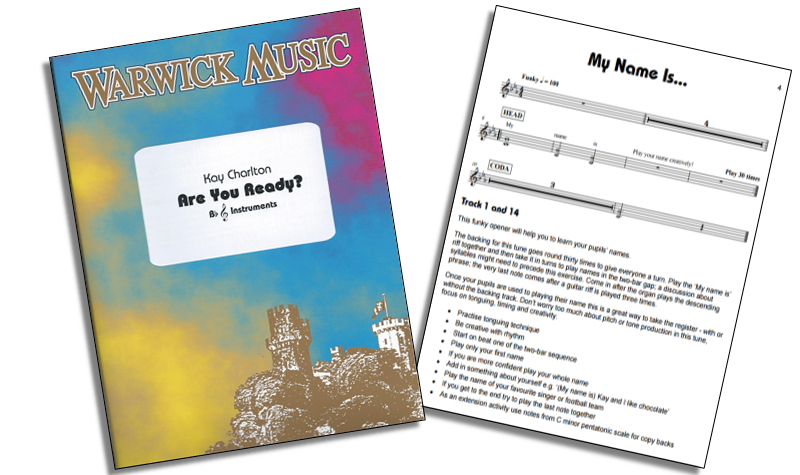 Starting with simple one–two note tunes, and moving on to four–five notes, this book will aid creative music making and progression for whole class ensemble teaching. The tunes are designed to be taught be ear and all have words so that the melodies can be learnt by singing first. These tunes and backing tracks have been thoroughly tested on my year 4 trumpet class – ‘Lay down the Bass’ was a particular favourite! The notation is for the tutor, not the pupils, although some tunes use simple rhythms which could be used for beginner readers. Some of the pieces have differentiated harmony lines as optional parts – some parts are easier or higher/lower and some are aimed at the tutor or more experienced pupils. Each backing track has two versions – the first is with a trumpet guide, the second is without the guide. Each tune has a two–bar count–in on snare drum and the same two–bar count also signals the end of the solo section. The tracks on the CD can also be accessed on the Warwick Music website as MP3’s so that children can practise or listen to them at home. Kay Charlton is a trumpet player, composer, educator and Arts Award Adviser.